A gaping vacuum, the cosmos of fiery stars and galaxies, chaos without any intelligent design. But what if there is a wild omnipotence in it, personified in the form of architects of the universe, emerging celestial bodies out of nothingness. What could be their motivations, and can pure competition be a moment of reprieve from the surrounding cosmicism? The creator of the game is Rémi Saunier. Stellium appeared on the market in 2017, published by Ankama, and in the first quarter of 2019 the Cube Factory of Ideas did the Polish edition. Graphic design of the project is made by Aurélie Guarino. 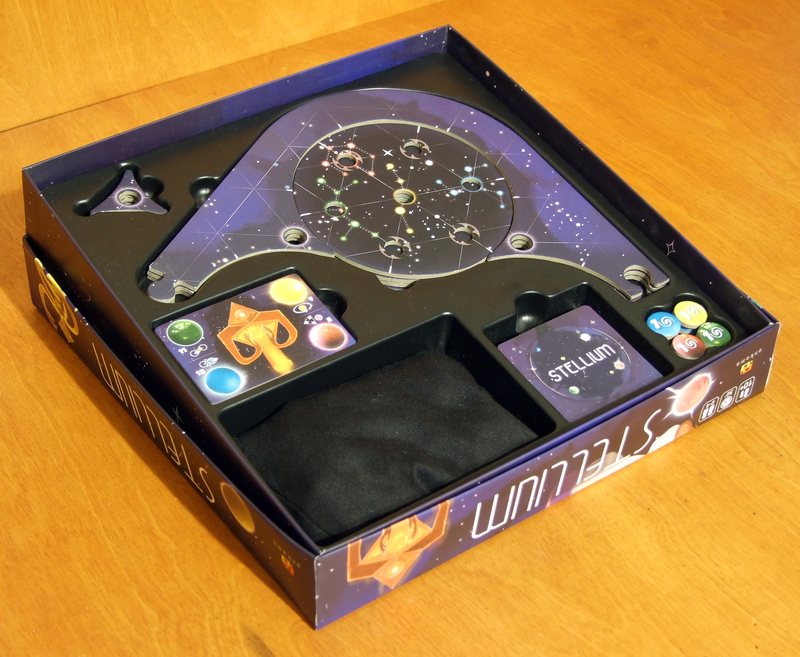 In a standard size box, we get some tokens, help cards, the first player marker, a cloth bag, lots of marbles, a deck of cards and a modular game board in the form of cardboard circles of galaxies with a frame of outer belt. 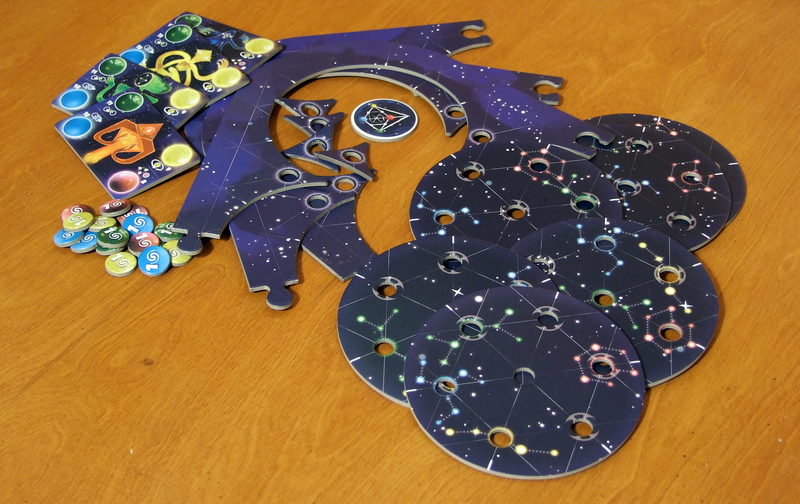 Everything fits perfectly in the plastic insert prepared for the components. In my opinion, it is worthwhile to fill the space at the bottom of the box with something, so that the insert will reach the box lid, because when storing vertically, unfortunately, everything will fall out of it. The components are solidly made, the deck of objective cards is not exposed to extensive shuffling and does not need to be sleeved. The elements of the board are made of 3 mm thick cardboard. Despite the high durability, due to the fact that these parts are constantly working, its components are exposed to delamination at the edges. Fortunately, it’s easy to deal with this problem by soaking them with pva glue. Marbles are an eye-catching element, and if you do not “mistreat” them with aggressive mixing in a bag, nothing should happen to them, although after a sufficiently large number of games, you will probably notice chipping here and there. All components have clear and consistent graphics. The subject of Stellium is matched perfectly to the mechanics. 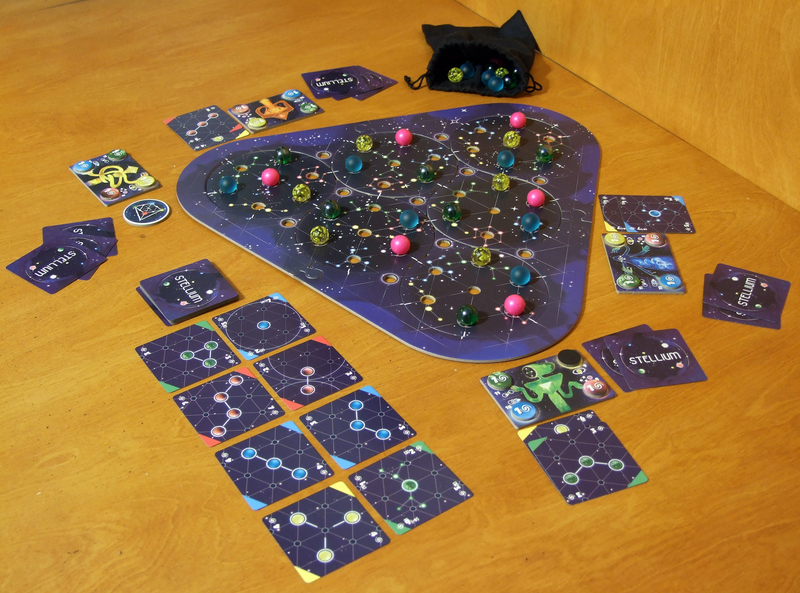 Even if It is a game that could be completely abstract and unrelated to any setting, by placing the players in the position of divine architects, it compliments putting marbles on the board as a model of the universe very well. The celestial bodies that we will use are stars, planets, comets and supernovas. Mechanically, we’re dealing here with a solid game of pattern building genre. The player in his turn has five seconds to pull a glass marble from the bag. Then, depending on what type it is, he applies its rules while placing it on the board. Checks if any patterns on the board are identical to those on the cards in his hand. If so, he lays out those cards in front of him, indicating how many points they give him, discards the marbles from the completed systems (always leaving out one) and proceeds to draw one new card with a pattern to be made. The game lasts until one of the players reaches the given victory point threshold. The idea of ​​the game is nothing new, but the element that enriches it so much that it is worth to play, is the possibility to almost entirely eliminate the random factor. When you need a particular celestial body, you can feel it. Each type has a characteristic surface feature – the comets are rough, the planets are smooth, the stars have a grainy coating, and the supernovas are uneven. Even if you pull out a marble you don’t need, you can simply use one of the four tokens, each representing one celestial body rule to mitigate it. 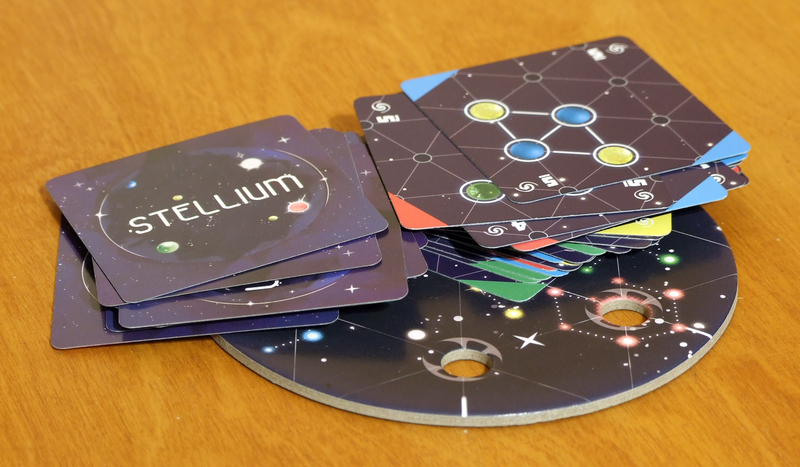 In Stellium, you can play in a group of 2 to 4 players, where one play can take about 30 minutes. The game does not last long, because there is not much of a downtime. I noticed that the more I played it, the more I liked it. In the third game I was already able to accurately determine which marble I caught, which gave me more control in creating patterns. Due to the fact that we have only 5 seconds to catch the right celestial body, the ability to recognize is not something that gives you too much advantage. Sometimes you just won’t be able to find the marble you need at this moment. The game is flexible when it comes to the approach to the play. We can play it tournament style, remembering who has chosen what card and watching to effectively break their pattern, while making one of our own. We can also focus on our own joyful arranging of colorful marbles, regardless of what happens to other players and have pure fun of creating galaxies. If you do not have this type of game in your library, I recommend completing it with Stellium. Otherwise, I strongly encourage you to just try it.